'After' photos of Andy and Karen's kitchen and living room. DIY-ers Andy Lacey and Karen Ronneback. It is not like Andy Lacey and Karen Ronneback were born into modernism. But, as it turns out, it suits them just fine. The couple hails from Cheltenham, a 900-year-old college town in southwest England, filled mostly with homes of the Victorian and Georgian style. "Nothing mid-century modern at all about it. We couldn't have come from any place more different," says Andy, now the main writer at the couple's homegrown blog site, FogModern.com. In 2011 they traded old England for New England, moving across the pond to Boston. By that time, they had nurtured a taste for do-it-yourself projects, having restored a handful of small residences in the old country. They liked Boston, but there was too little there to satisfy their growing preference for MCM. "We always had an interest in design and architecture," says Andy, noting that Karen was a fine arts major and they had already acquired a Robin Day Forum sofa and four RobinDay 675 dining chairs they brought with them from England. 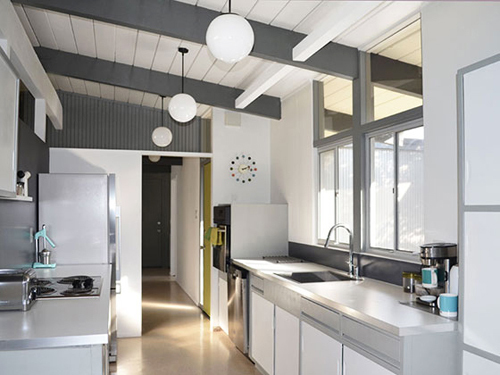 The couple began perusing modernist homes on the Internet and soon realized that what they craved in a home was what Joe Eichler had built in California. Studying the Eichler communities, they targeted the East Bay but couldn't find a home priced in their comfort zone, with Andy recalling, "We watched all the prices going up while we waited." 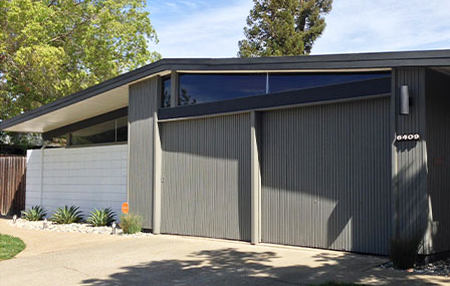 Finally, East Bay-based Eichler realtor Thomas Westfall helped them focus in on the South Land Park Hills neighborhood of Sacramento, where there was only one small neighborhood of 60 or so Eichlers. "It's a small community, but people are passionate about their homes," says Andy, noting that the lot sizes were also slightly larger than for most Bay Area Eichlers. Negotiating from across the country, he adds, "We didn't even come to Sacramento until we got the key!" 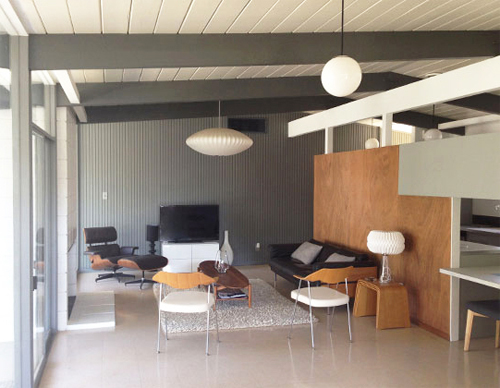 "It had been well cared for...We were a lot luckier than some," he says of the four-bedroom Eichler the couple bought in 2013 from the son of its longtime owners. Still, there were certainly things that needed work to return the place to its mid-century heyday: oddly painted kitchen sink, painted mahogany paneling, etc. "We've just been undoing things like that," says Andy of the last two years. "It seems less common here to do your whole house yourself." But Andy and Karen's renovation did take them through every room of the house—and outside too, with painting and landscaping. The British couple's DIY dream had another side to it as well, Andy admits: "I always had it in my head that I would write about what we did...I love to write." And so they launched FogModern.com, a site dedicated to documenting their home renovation—mainly for their own benefit.